WHO ARE THE “MEN IN BLACK”? Interlocutor: As for the "Men in Black", those who apparently have connection to UFOS, Are they terrestrials or extraterrestrials? 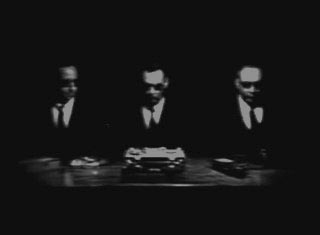 Johnakan Ur-El: The real "Men of Black" are, let us say, agents of a secret organization of intelligence in The United States that have had contact with beings from other systems and they keep that information concealed, obviously. This organization is above any other organization of intelligence in the United States. Interlocutor: And what is the mission of these people? Johnakan Ur-El: To make sure that nobody knows that extraterrestrial contacts exist. Johnakan Ur-El: Correct, it is something completely stupid, and they have even burned the so-called “X files”. They have burned thousands and thousands of files, pictures, films, proofs, they got rid of metals from fallen UFOS, and they have stolen everything from the FBI files. Interlocutor: But there must exist a feeling of power, I mean, keeping a secret that no one else knows, It is total Ego! Is it something like that? Johnakan Ur-El: Sure! It is such a powerful agency that they’ve even brainwashed to the agents so that they are practically zealots and they have even done things that the president of The United States himself ignores. Interlocutor: How is that concealment possible? Johnakan Ur-El: They inform to the president only the things they are interested he knows, but nothing else. Interlocutor: Do you confirm me, then that “Men in Black” are terrestrials? Johnakan Ur-El: Those people are not extraterrestrials, but human beings from the most secret agency in the United States they are even above the FBI, the CIA, and any other Naval Intelligence we know it is also above the FBI. Interlocutor: But how has it been formed? Has there been extraterrestrial influence? Johnakan Ur-El: It has been formed by terrestrial heads and since the decade of the 40s. It was growing, growing, and now they have extended throughout the world. Interlocutor: But I suppose that there was an extraterrestrial contact first so that this secret organism began its functions... Is it correct? Johnakan Ur-El: Of course! They have experimented with living extraterrestrials, they have experimented with Antheans, they have experimented with Antarians , they have experimented with a lot of human beings. Interlocutor: This is very hard to believe... Is there in these terrestrial organizations, members of the so-called occultist “Black brotherhood”? Interlocutor: But are the 17 Black Fraternities behind this hidden American organization? Johnakan Ur-El: No, because there is no harmony among them. There is envy, bitterness, fights... they have automatic weapons and if they think that some of them will defect, they execute him coldly shooting him in the back of the neck, and then they make disappear the body. Interlocutor: But this is like being in a minefield! Interlocutor: But which is the fundamental purpose of this agency? Obviously, if it has some goal. Johnakan Ur-El: The goal is to research and give power to the country you call United States, taking advantage of the experiments made with total impunity on the human beings and also taking advantage of the extraterrestrial technology. Interlocutor: Isn’t one of the reasons to hide the existence of extraterrestrials in our planet in order to avoid panic in the population? Johnakan Ur-El: No, not at all, they do it with the purpose of continuing experimenting secretly and to obtain the knowledge exclusively for them, as a factor of power. You already know that knowledge is power, and that is what they are looking for. If they allow that this knowledge be disclosed that the knowledge belongs to all, they will lose power and that is something they don't want. They only want the power and knowledge for them. Johnakan Ur-El: There are many cases of abductions that were not made by extraterrestrials, but by secret agencies of The United States, because those people possessed knowledge they didn't want to be disclosed. Interlocutor: And the case of this couple? Johnakan Ur-El: Yes, it’s the case you are referring, it has been a terrestrial abduction, human beings kidnapping human beings to experiment with them. Interlocutor: Did these experiments have the purpose of curing them? Johnakan Ur-El: No, the purpose was purely selfish. They looked for the way to cure, but at the cost of those human beings, used simply as “guinea pigs”. Interlocutor: It is something really monstrous, because the end doesn't justify the means! Extraterrestrial beings from Anthea and Antares. Betty and Barney hill, a case of a terrestrial abduction. This entry was posted at Wednesday, June 17, 2009 and is filed under Area 51 . You can follow any responses to this entry through the .